Someone posted these on LJ and I fell in love. I saved the photo to my desktop for future lusting over and I thought I would share with you fine folks. Sorry to the OP if you read this and care that I swiped your photo. It's all in envy! 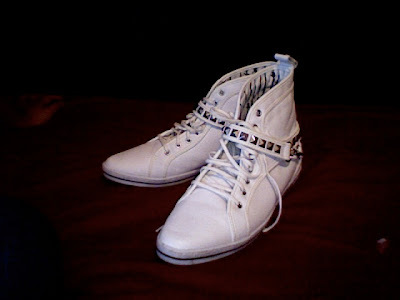 I should also mention that he got two other pairs and it all came to $50. Why doesn't Winnipeg have sample sales? Also I've decided that I want to own designer clothes but I don't want spend money on them. I already tried winning McDonalds monopoly and that didn't work... Any other suggestions?Quick! Whore out my blog so designers send me free stuff... I don't know. And as my first order of business, I'd like these four items from Reborn please & thank you. All four items for $878.25, can't go wrong! So if anyone would like to paypal me that money, or just order off the site and I'll give you my address that would be great, thanks! Merry Christmas! i want those shoes SO BAD. emma is right. if you want real life rewards, you need to be a real life whore. or get a job??? ima borrow those shredded jeans and that green top thing if somebody buys those for you. thanks. is Reborn like Oak NYC 2.0? it's all of the same stuff! definitely check oacknyc.com, maybe you'll have better luck there.